For more than 20 years, I lived among the dead. The Mount Calvary Cemetery was next to and across from our house on Burlington's Pomeroy Street. I could see headstones from almost every window. Graveyards have never spooked me, and I love to visit a good one: Mount Auburn in Cambridge, Père Lachaise in Paris, to name a few. And while they may seem static, the place where things are finally most unchanging, cemeteries are actually full of subtle human activity that plays out in slow motion. From my vantage point, I watched the preparations for many funerals. Tuck, the longtime cemetery superintendent at Mount Calvary, would first dig a hole with the backhoe, squinting from the smoke of his cigarette. Then he'd pull the green Astroturf carpet over the rude mound and retreat to the fringes, to wait. Soon would come the procession, with its solemn images of grief: the black hearse, the family in somber colors. Near the end of the service, Tuck would reemerge, almost invisibly, to lower the coffin into the ground. Then it was back to the edges, and another cigarette, to wait until the last car had gone. Afterward, he'd fill the hole with dirt and arrange the flowers over the grave. A week later, when the blooms had withered, he'd take them away. I logged a lot of miles walking among those gravestones thinking about the history they represent: the flu epidemic of 1918; soldiers killed since the Civil War; the extravagant losses of children. I loved discovering the strange first names: Vergene, Exilda, Pimage, Napoleon, Philamen, Zeb, Almina, Eusebie, Vataline and Alida. In one area of the cemetery, all the stones are as tiny as the babies they memorialize, and many have small, carved lambs on top. Among the old bones there was always something new to notice: an epitaph that read simply, "I tried." I found one headstone carved with the name of my own, very-much-alive 85-year-old father. Every spring, I was surprised and moved to see fresh flowers on graves that dated back 40 and 50 years. The majority of grave markers at Mount Calvary are stone, but some are homemade, fashioned from cement, pipe or wood, with the names and dates stenciled on. In the older sections, they're mostly adorned with traditional symbols of death: the fallen cross, an urn, a draped cloak. But in recent years, more personalized images have been sandblasted into granite. On one, a curious deer watches a fly fisherman. Another, for a 12-year-old, features a tractor-trailer and the words "We love you, Bobby." Betty Pike's stone shows a very sad cat's face. Stella Norton's icon is a winning Bingo card. Most peculiar, perhaps, is the memorial stone for a once-fun-loving couple. His chosen eternal image: a six-pack headlined "King of Beers." For her, a single Pepsi. Last winter, a wreath appeared made entirely of Budweiser cans. Next to Mount Calvary is St. Joseph's Residential Care Home, a likely last stop for its aging residents. I met one of them, Burt Gamelin, walking through the cemetery, which he crossed twice daily to visit his wife. His "lady," as he called her, had died more than a decade earlier, but Burt was faithful, walking with his cane in all weather to see her. He and Tuck became friends, and in winter Tuck would shovel a path in the snow so Burt could get to Marion's grave. Sometimes I'd see them both sitting in the truck, talking. Once in a while, Tuck took Burt out into the wider world for a short adventure. But Burt was certainly not the only regular. One woman spent a few quiet minutes every morning near the grave of someone she clearly missed. And on the other side of the cemetery, a father came daily to visit his son. For years he drove his truck into the urban sanctuary to spend time with Timothy, who died in 1984 at the age of 20. The boy's headstone is big and black, and its shiny newness seemed to reflect this father's irreconcilable grief. Every morning he groomed the grass around the monument and picked up debris that had fallen since the previous day. In summer, he tended a neat garden at the foot of the stone. At Easter, he brought flowers; at Thanksgiving, wreaths. For Christmas, he drove two plastic poinsettia-covered crosses into the ground. When it snowed, he cleared a path from the road around the stone and over the grave. Carved in the black granite above Timothy's name is a drum set — without a drummer. On the right side were spaces for the names and dates of his father, mother and sibling. In 2010, Timothy's mother's name was added to the stone. Sometimes I felt guilty for witnessing other people's sorrows and the intimate communions with those they'd lost. I saw occasional illicit activity, too: love trysts, drug buys, people down on their luck sleeping under the bushes. But a cemetery is a public place, and the ways that people grieve, and remember their dead, are on display. And when Timmy's dad stopped coming every single day, I was glad for him. But again last year, there were the wreaths and, in front of Timmy's name, a set of drumsticks. Eventually Burt died and was buried next to his wife. Then Tuck died, at 57, and he too went in the ground he had readied for others. Even Tuck's cat Pete has a stone. After Tuck died, his assistant took over and hired Branca, a Croatian refugee. He and his family live in a little brick house on the grounds of the cemetery. Branca's son, Nikoli, is buried there, too. He died 10 years ago, in a motorcycle accident, at 21. With such neighbors you can't forget: No one escapes this fate. 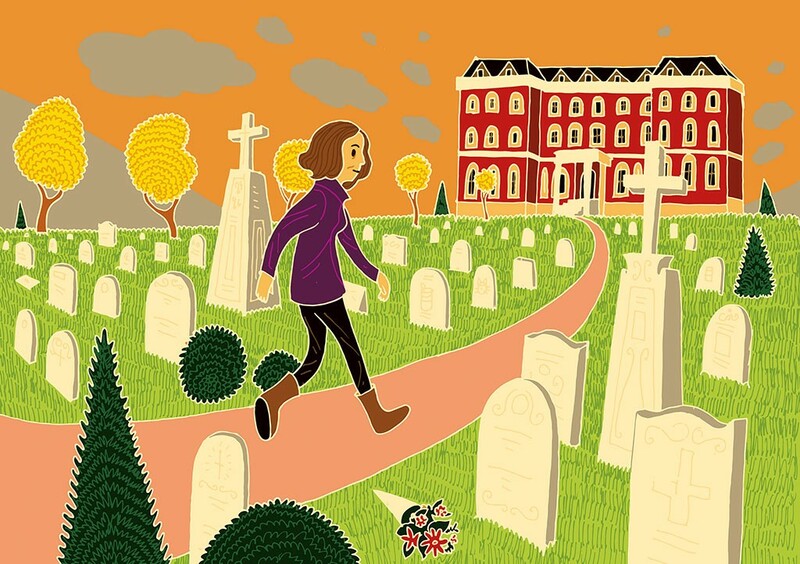 But living next to a cemetery also taught me so much about grief and fidelity, about people's quirks and humor, about their loneliness and their long devotion. A couple of years ago, I noticed an offering on the headstone of a woman named Hattie, who died at 17 in 1926: a bouquet of plastic flowers, along with a black-and-white photograph in a Ziploc bag of two young girls in old-fashioned dress. On the back, the dead woman's niece had written: "Hattie and mom." Last spring, after all those years, my family moved to another part of Burlington, where we are surrounded by people who are very much alive, and generous and welcoming. But it was particularly hard to leave behind my old neighbors, those underground and the ones above who tend them. I miss those daily reminders of people's constancy, so much so that I sometimes stop back to visit. I know those graves will be here as long as I am — and long after. There's company in that, and comfort, too.